Tabberone Our Soldier Wall 2019. Between Cup Of Joe For A Joe and AdoptaPlatoon we have had a bunch of adopted soldiers over the years. 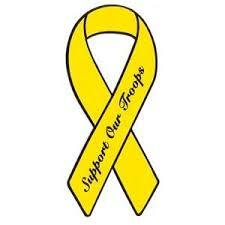 We began supporting our troops through AdoptaPlatoon in 2008. A few years later we heard of the Cup Of Joe For A Joe and began using them as well. This is a picture our soldier wall, as of February 12, 2019. On display are items we have been sent by various organizations and individuals. We just got our seventh American flag in February 2019. We link to pages with close-up pictures of the different gifts. Please excuse the camera flash as these are amateur pictures. Our first American flag, first flag from the left top row in the picture, has a certificate stating it was carried on a Kiowa helicopter during a combat mission on August 7, 2009, in Operation Enduring Freedom, by the 7th Squadron of the 17th Cavalry, 101st Airborne Division, Jalalabad, Afghanistan. In the corner of the flag frame is their special unit patch, "Death Rides", Task Force Pale Horse, Forward Operations Base Fenty. This was the first item sent to us. It came compliments of CH (CAP) Wayne M Scholle, OEF. To the right of that certificate, under the flag frame, is a letter from AdoptaPlatoon. Our second American flag, in the tan frame top row, has a certificate stating the flag was carried on a combat mission August 8, 2012, by the First Military Intelligence Battalion, Jalalabad, Afghanistan, on an unmanned aircraft (drone), in support of Operation Enduring Freedom. Signed by CPT Anthony J. Palumbo. 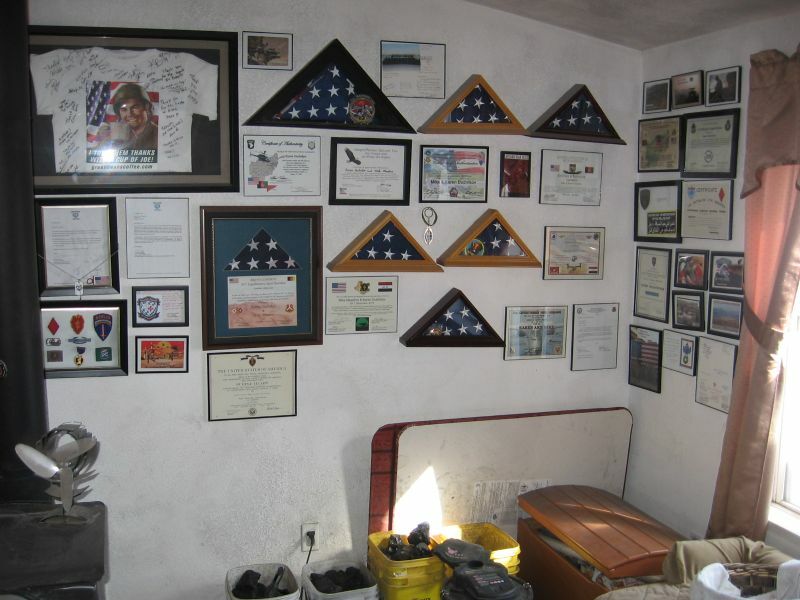 Our third American flag, in the large rectangular frame bottom left, has a certificate stating it was flown "in the face of the enemy" on February 3, 2013, by Bravo Company, 101st Expeditionary Signal Battalion, Kandahar, Afghanistan, sent to us by Staff Sergeant John P. Palmeri, one of our adopted soldiers through AdoptaPlatoon. SSG Palmeri also sent us three post cards after his unit received parcels from us. The framed flag was very unexpected. The three post cards are top right in the picture. Our fourth American flag is the third flag top row in the picture. It has a certificate directly below the flag is from the United States Forces, Afghanistan, stating the flag was flown over the headquarters in Bagram, Afghanistan on April 7, 2013. Signed by Maj Gen Kenneth R. Dahl. Sent to us by LTC John W. Weeks. Our fifth American flag is in the center (tan) frame in the second row in the picture. It has a certificate directly below the flag stating that on 1 December 2015, the flag was flown on a "Special Operations U-28A aircraft during a combat mission over Iraq in direct support of Operation Inherent Resolve". Sent to us by Emiri Katahara who has deployed back to the States. Our sixth American flag is in the tan frame (left side wall) bottom row in the picture. It has a certificate to the right stating that on May 2nd, 2017, the flag was flown over the skies of Al Anhar Province, Iraq. Carried aboard a MV-22B "Osprey" assault support aircraft during an aviation mission in support of Operation Inherent Resolve 17.2. Sent to us by MSGT Thomas Moore and the SPMAG Air Cell (Marines), stationed in Kuwait. Included was a unit sticker. To the bottom left side is a postcard from Kuwait sent to us by MAJ Eubanks who is in the same SPMAG unit as MSGT Moore. Our seventh American flag is from the 37th Expedititionary Bomb Squadron, Qatar. It has a certificate to the right stating that for "Karen & Mike", on September 11, 2015, the flag was flown aboard a B-1B in support of Operation Inherent Resolve. It was sent to us by Audrey Wolf. Date-wise it is out of sequence but she told us "it was packed in a strange place during the move" which delayed it getting to us.